This site contains images of military miniatures in 28mm and 1/72 (20mm). Please open the pages on the left to take a look - click on the pictures for a larger view. Some of the 28mm figures are based for Warhammer Ancient Battles and others for 1:1 skirmish battles. The 1/72nd (20mm) figures are DBA based. Your comments are appreciated - guestbook at right. Painting & collecting military miniatures has been a passion of mine for several decades - off and on. I have another site devoted to larger scaled figures (120mm & up). Please feel free to visit the link below for those figures. 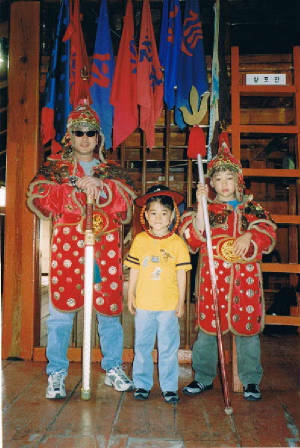 Me & my sons on a replica Turtle boat at Namhae, Korea..